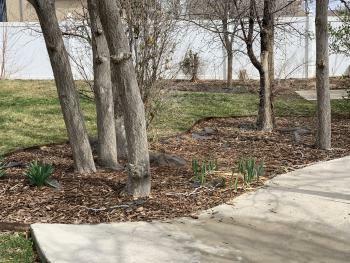 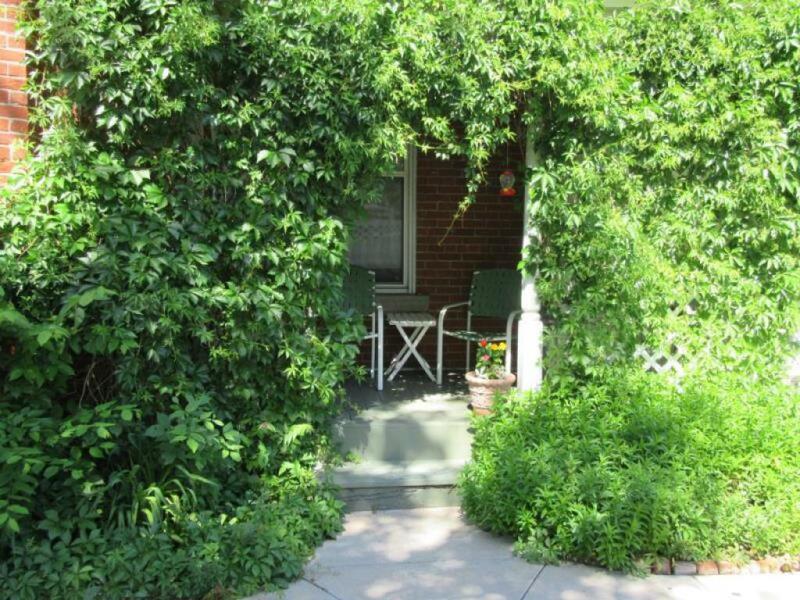 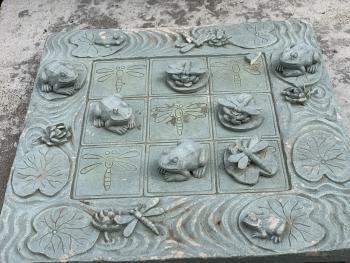 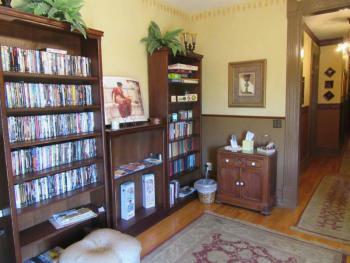 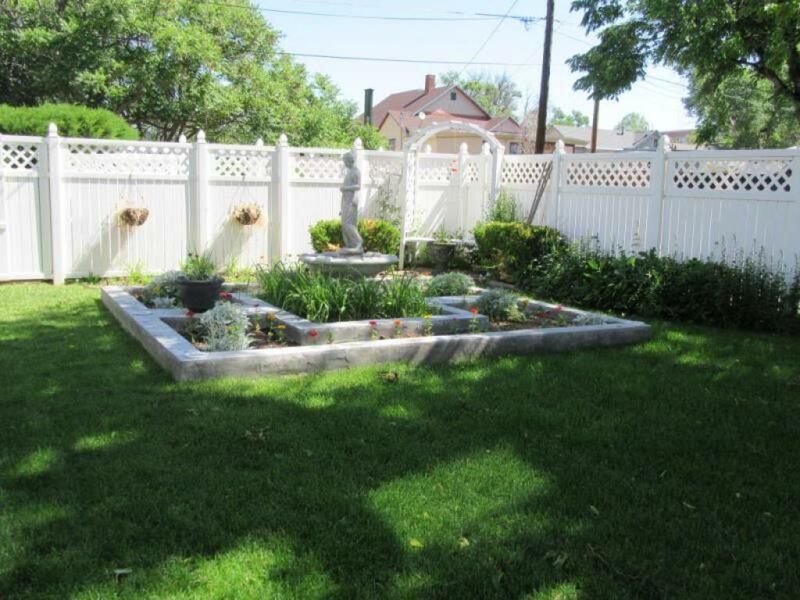 This first floor suite is right off the flower gardens. 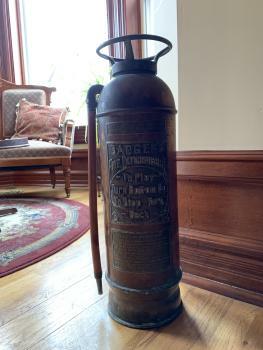 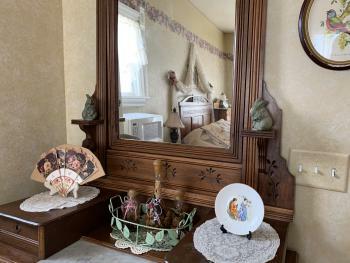 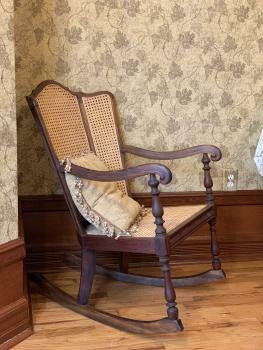 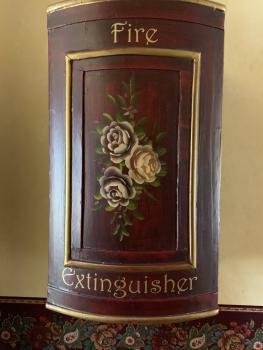 Its early 1900s decore gives a quiet respite from busy lives. 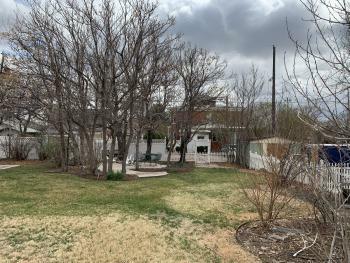 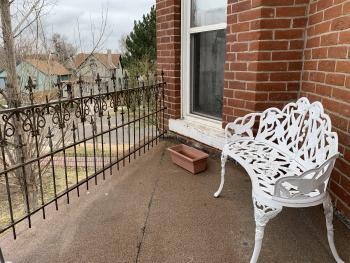 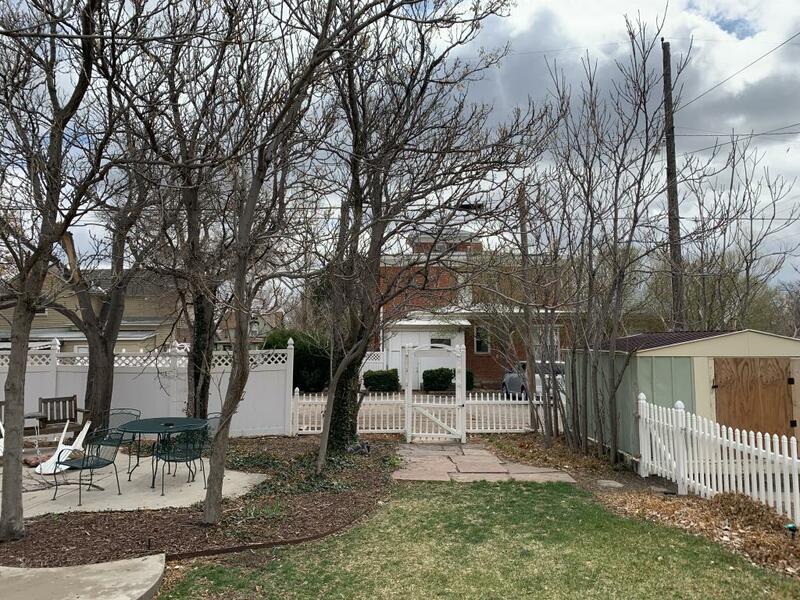 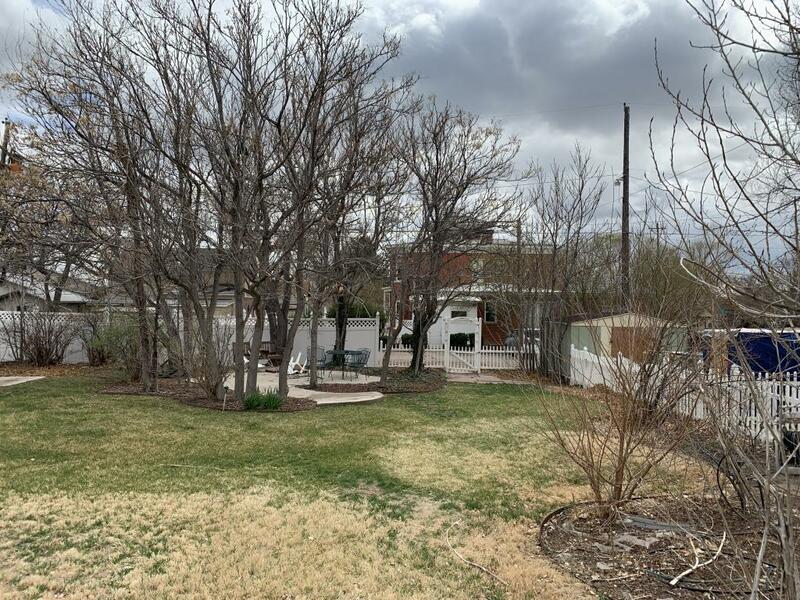 Includes a private porch that looks out on the garden, a two person Jacuzzi in the bay window, a queen bed and private bath. 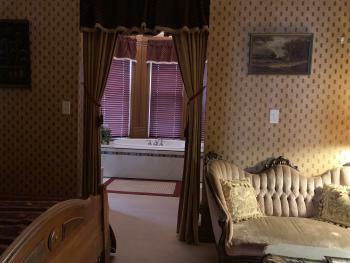 This romantic suite includes a full bathroom, parlor, fire place and bedroom. 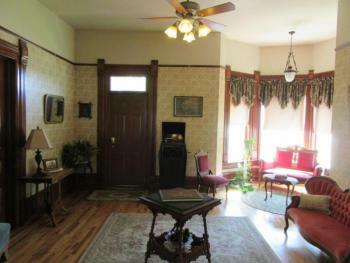 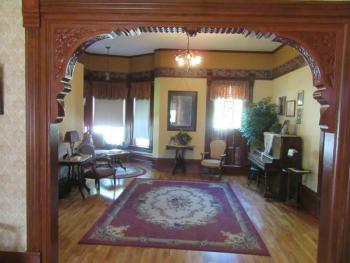 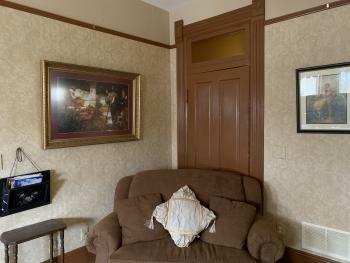 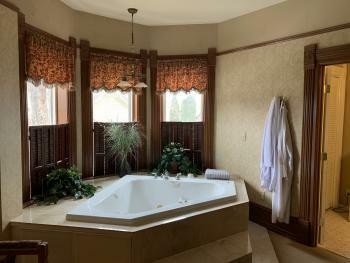 The parlor includes a two person jacuzzi with marble tilework, fireplace, and loveseat. 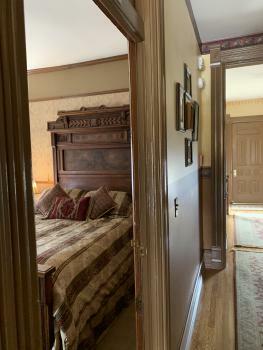 The bedroom has a queen size bed and private breakfast nook in the torrett. 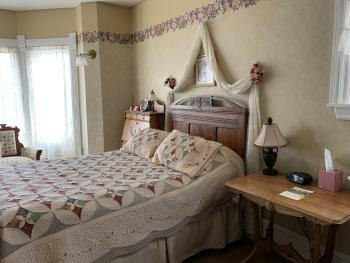 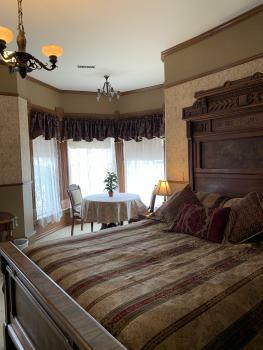 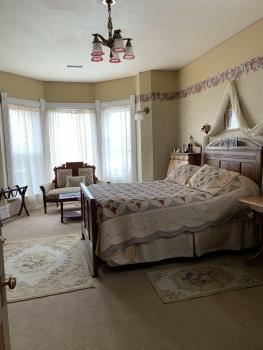 One of our favorite rooms filled with Antique European furnishings includeing full size bed, bedside tables, dresser. 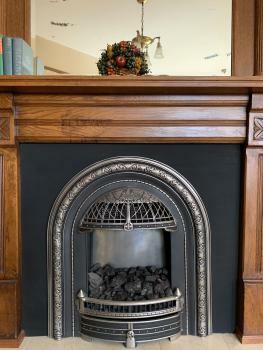 Enjoy your morning coffee in the turrett on the settee with table. 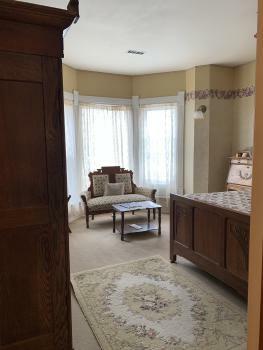 Many love this room because of its light and happy feel. 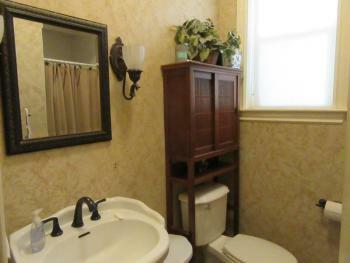 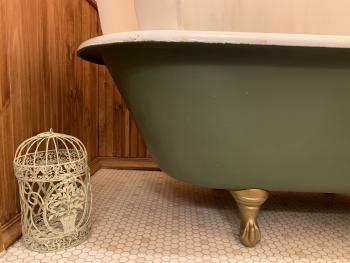 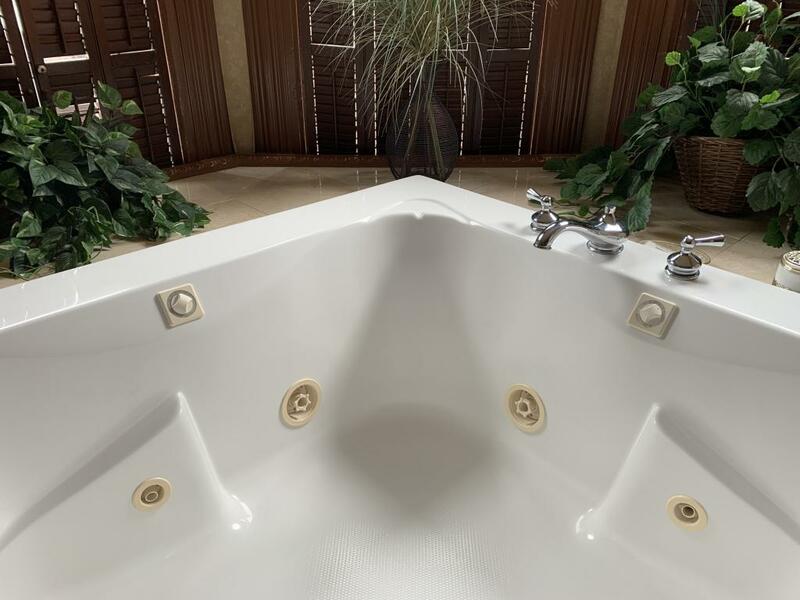 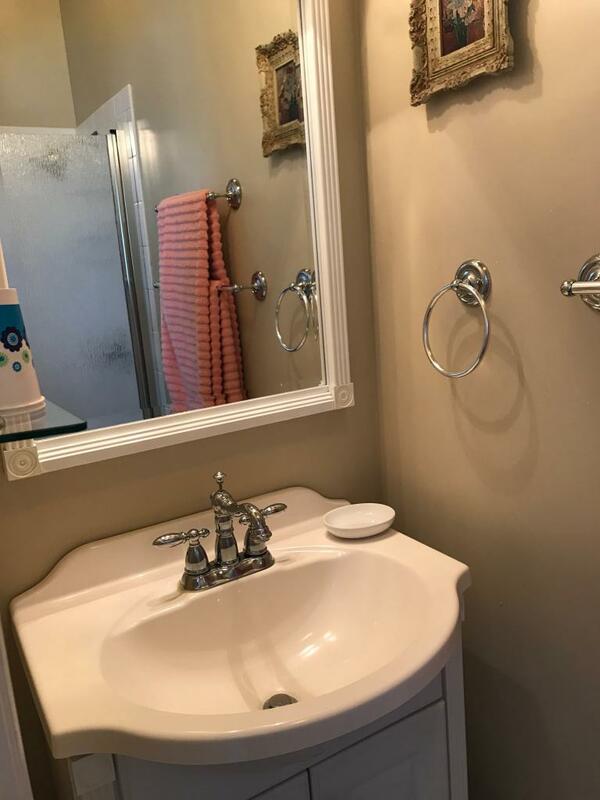 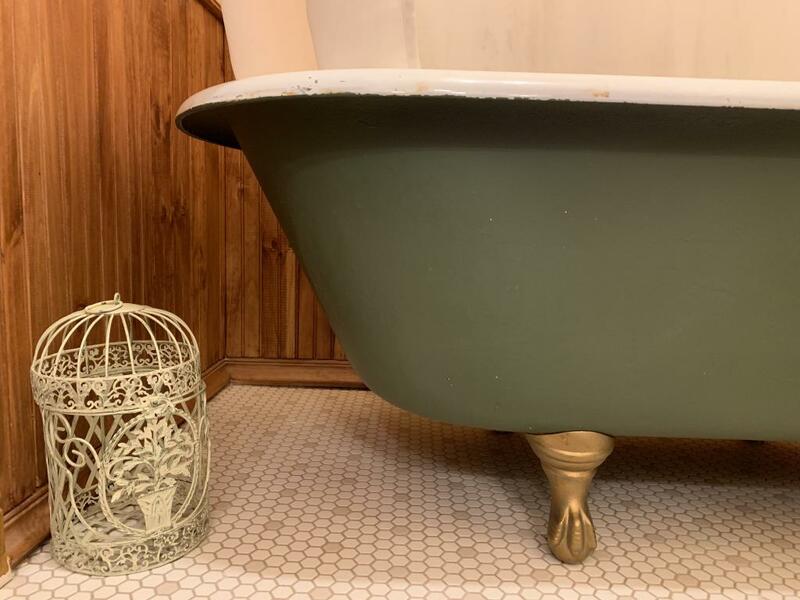 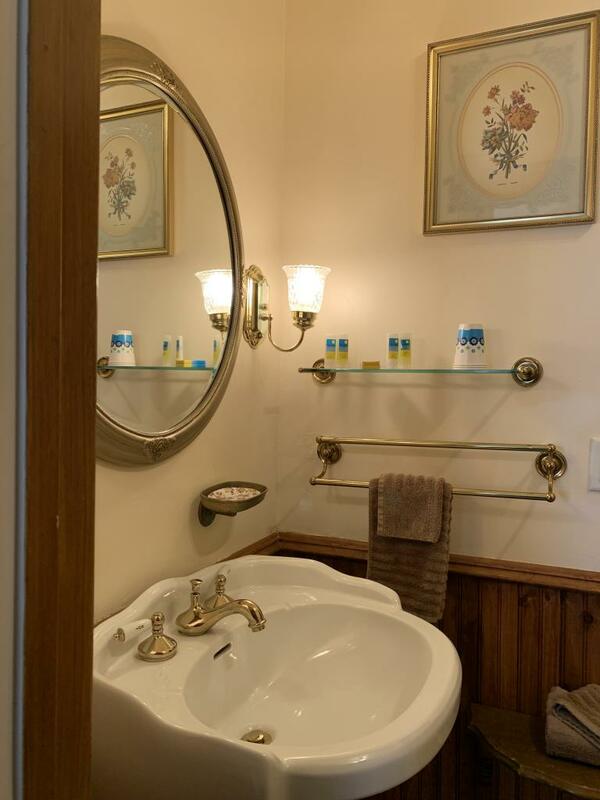 It includes a full size bath with clawfoot tub and shower. 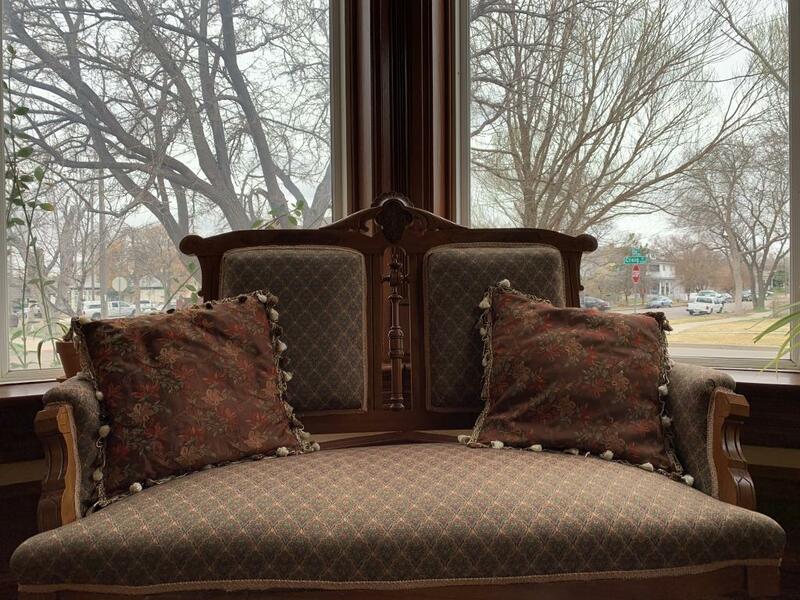 Set in the bay window is an antique settee. Also a desk, dressers, armoire, and bedside tables. 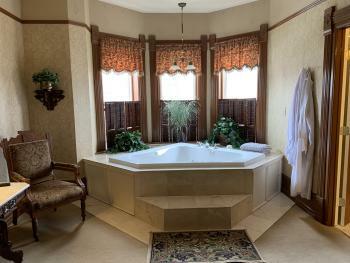 A Romantic getaway and carefree retreat. 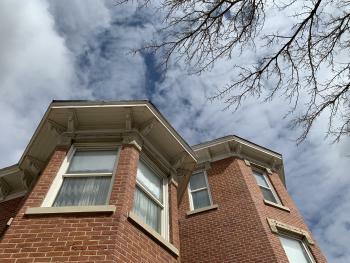 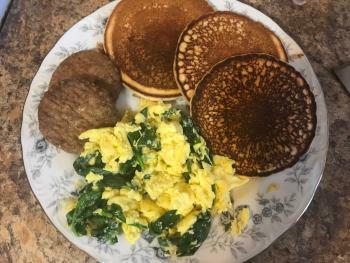 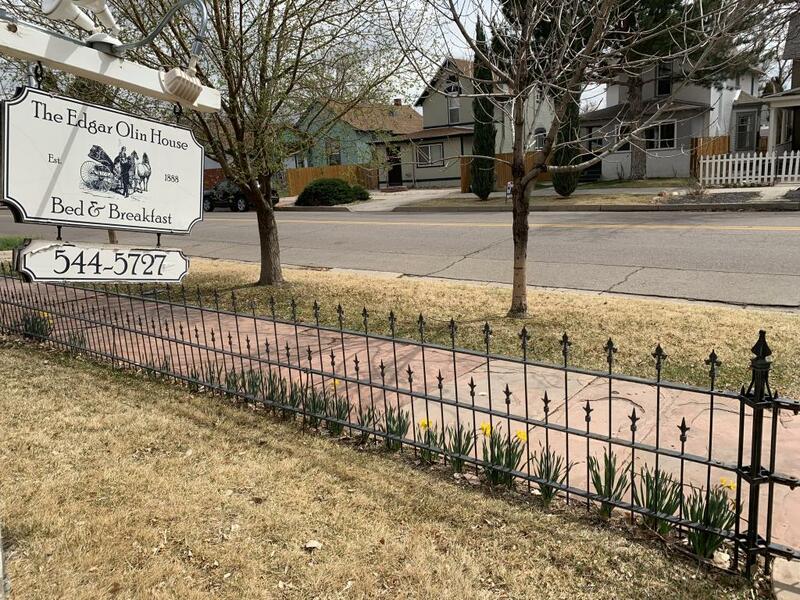 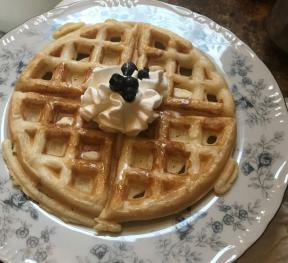 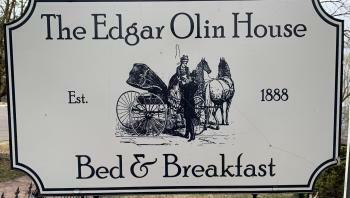 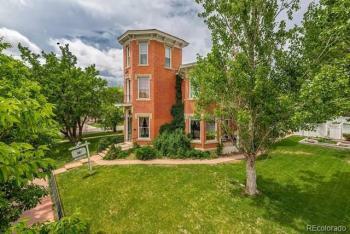 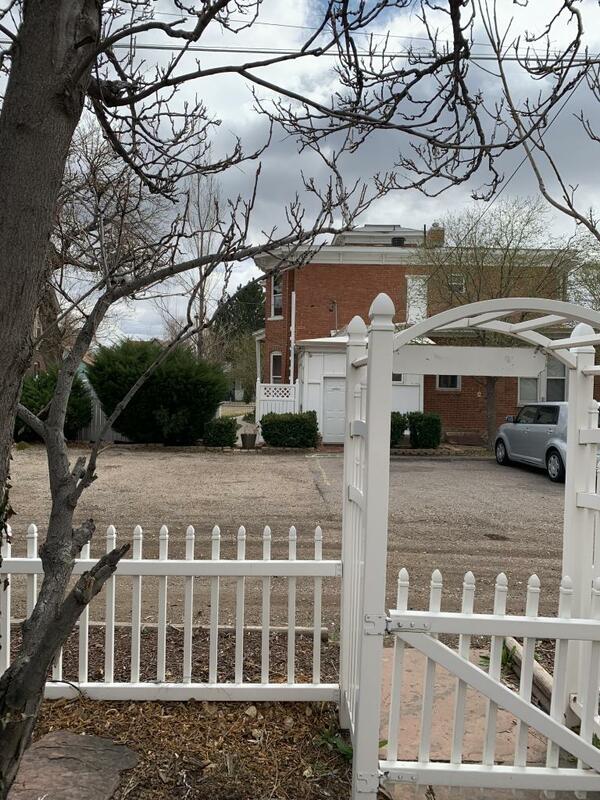 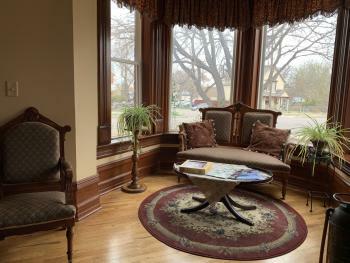 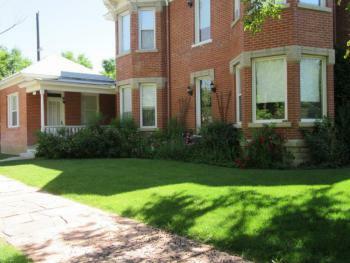 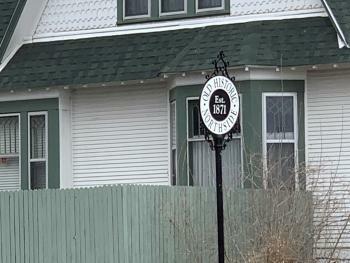 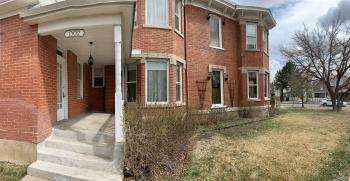 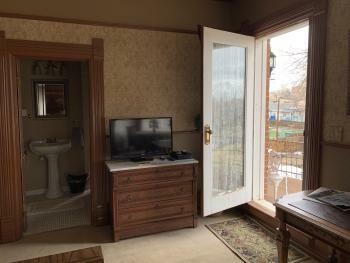 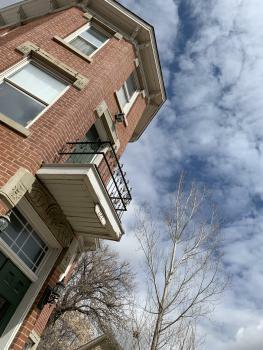 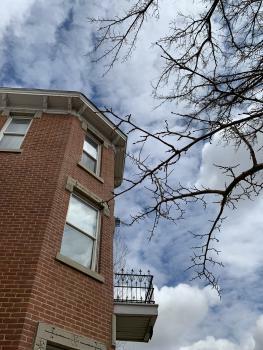 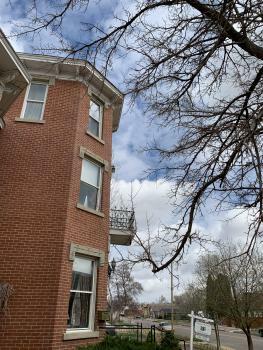 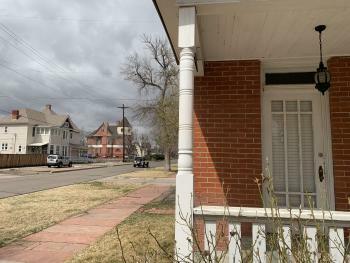 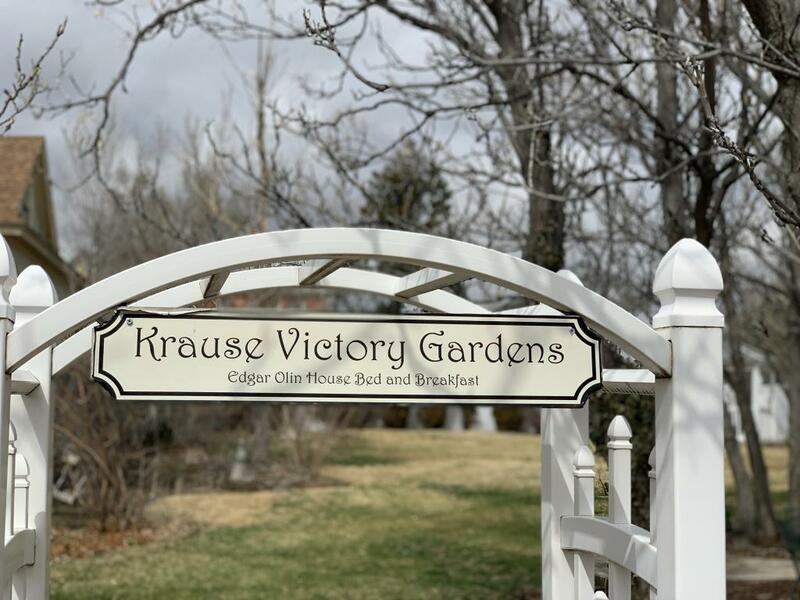 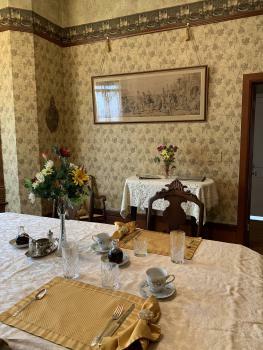 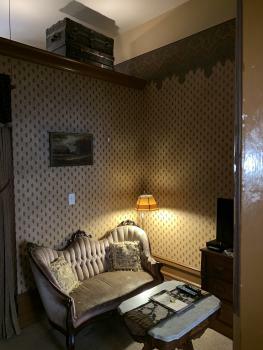 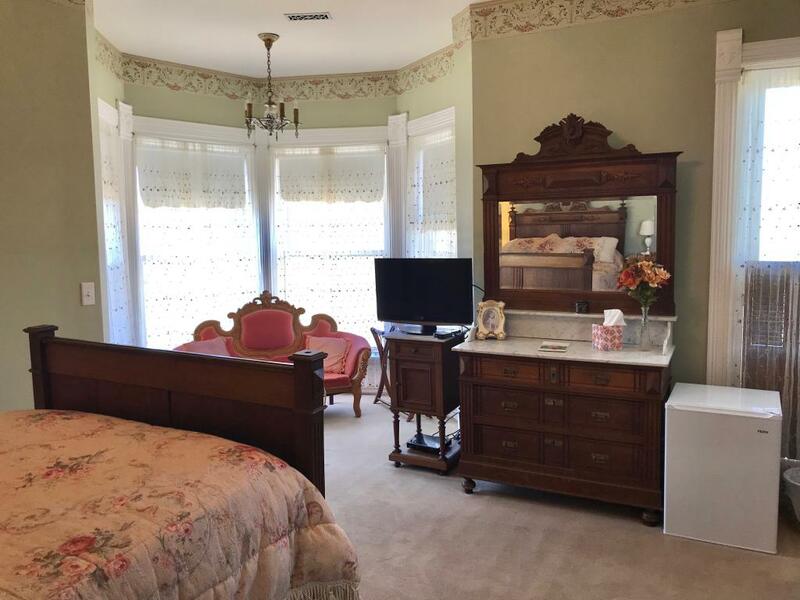 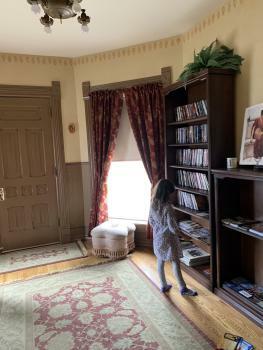 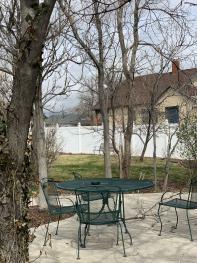 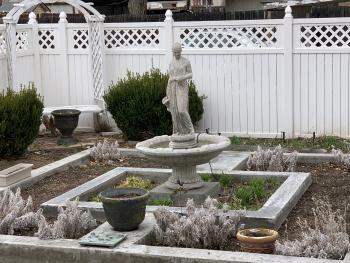 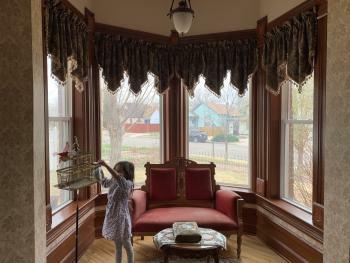 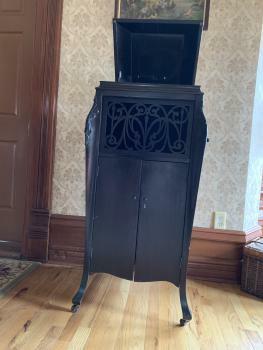 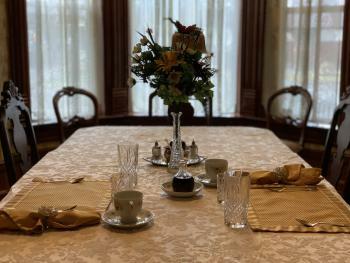 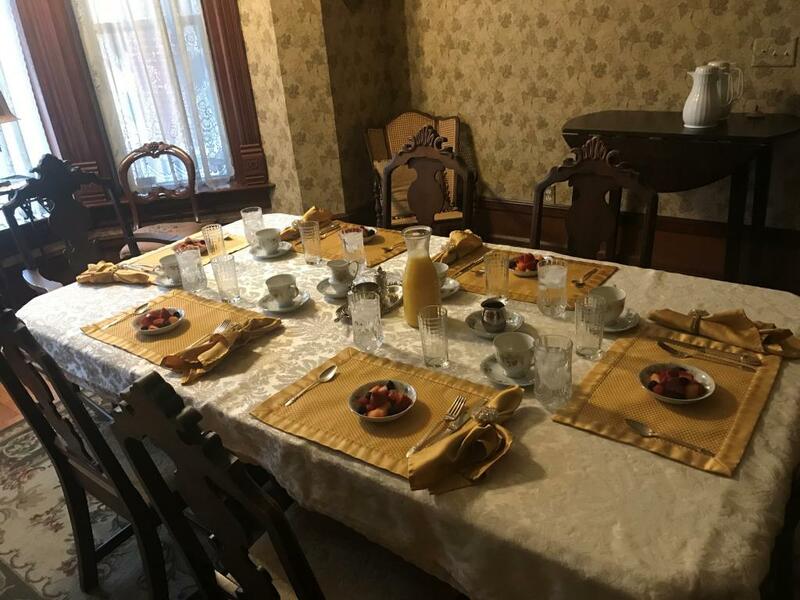 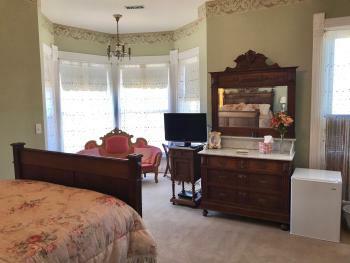 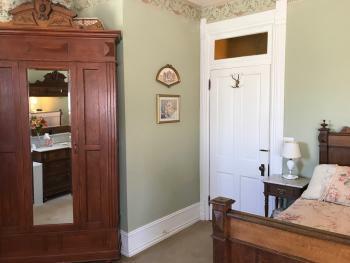 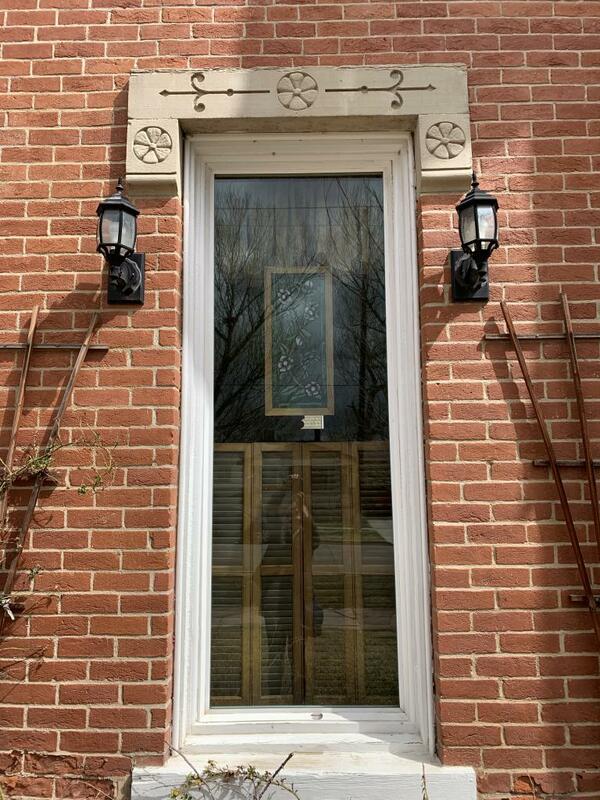 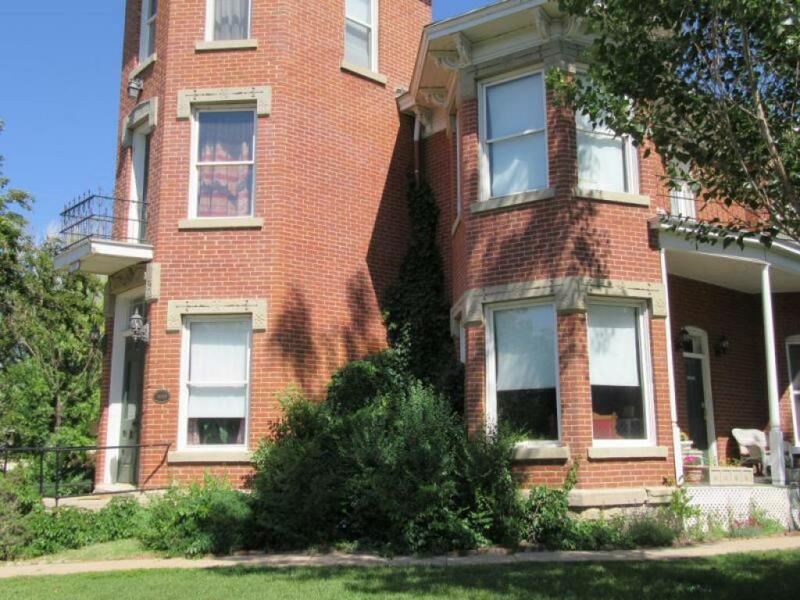 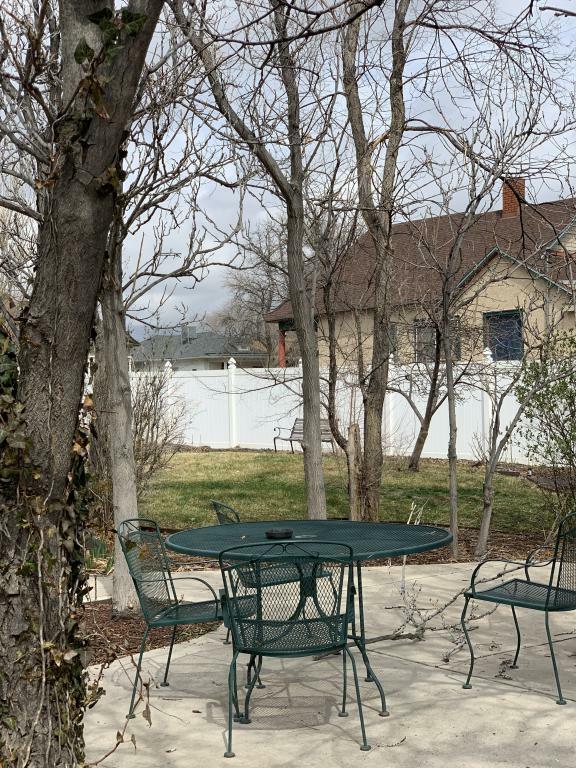 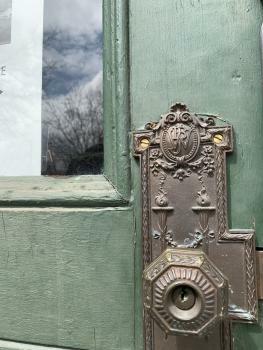 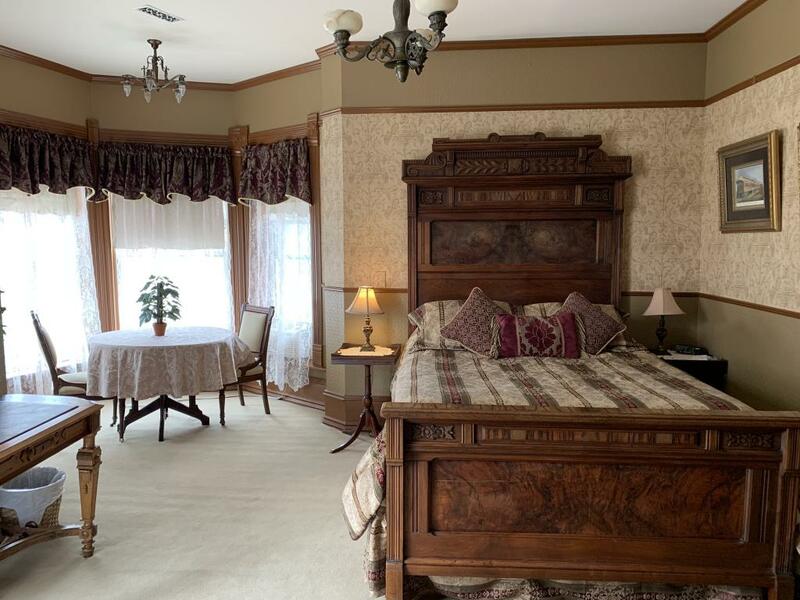 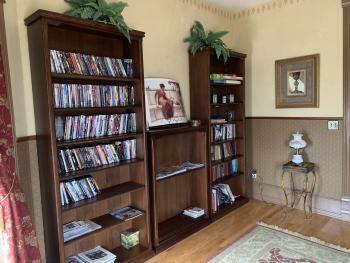 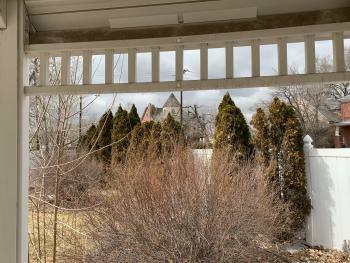 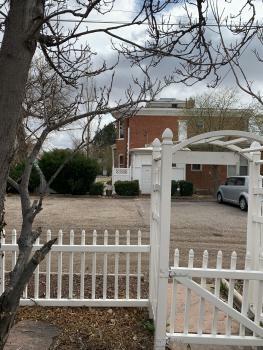 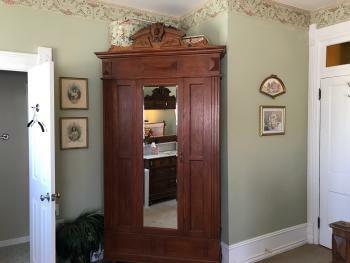 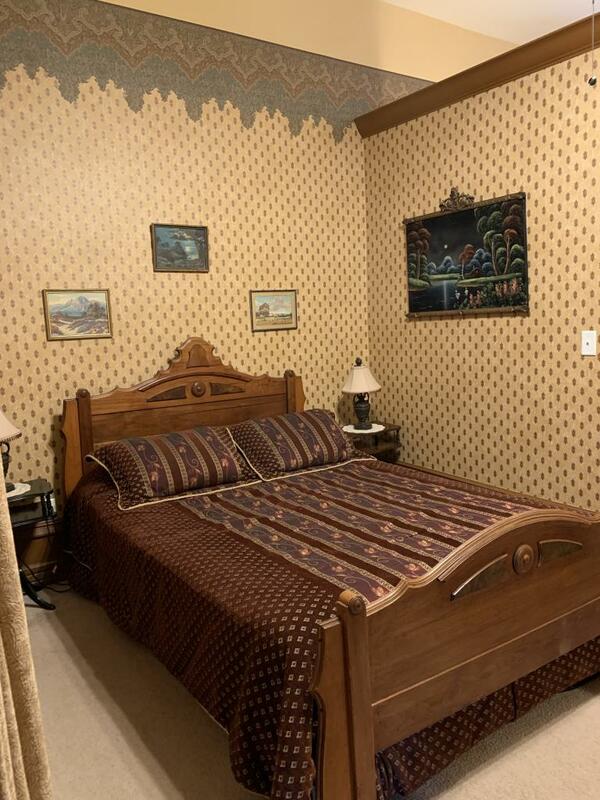 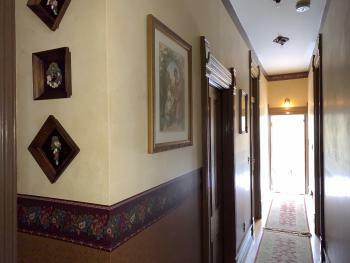 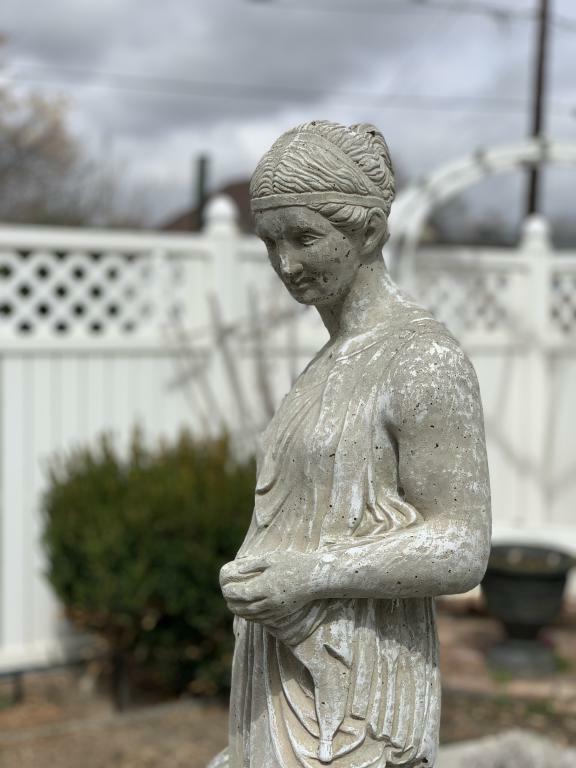 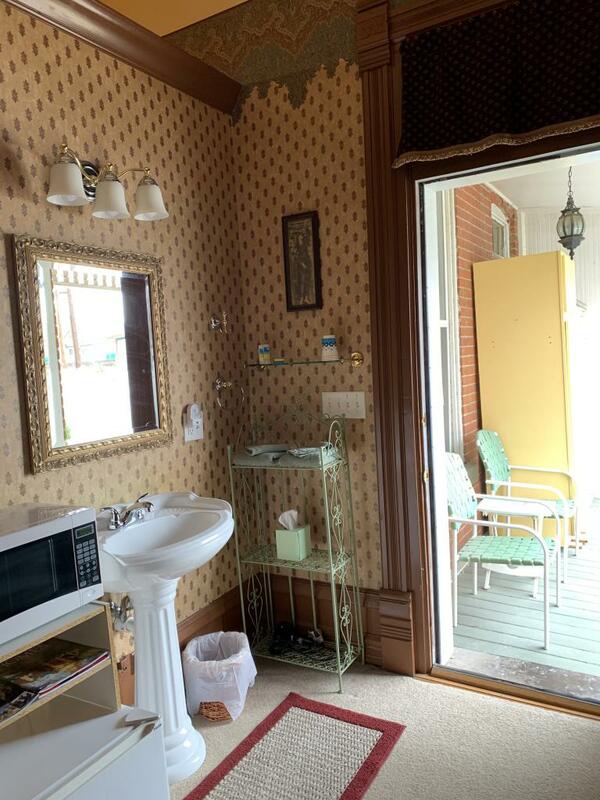 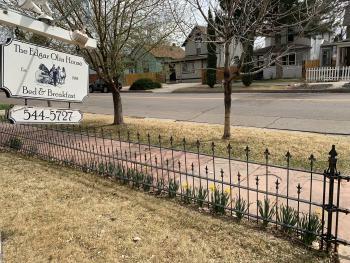 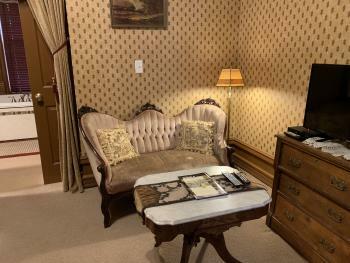 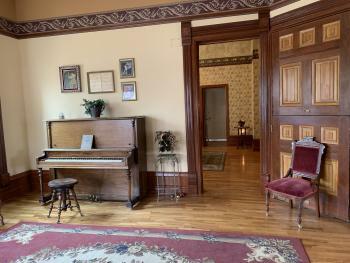 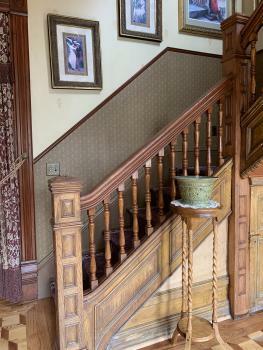 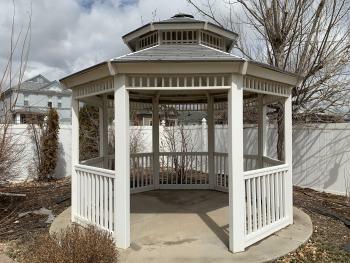 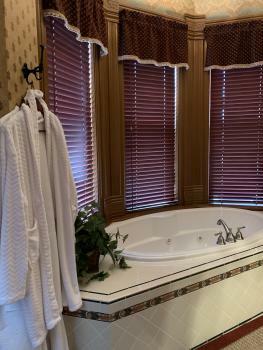 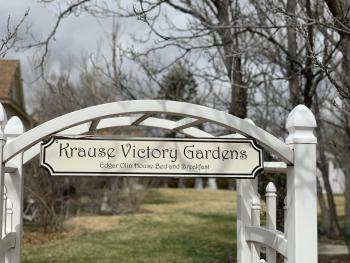 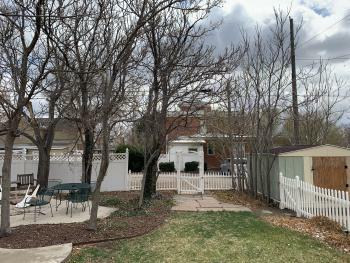 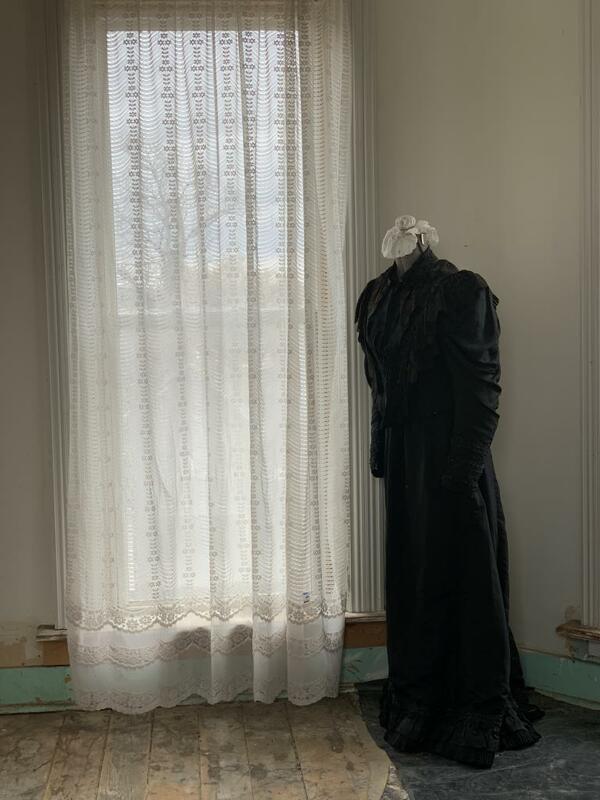 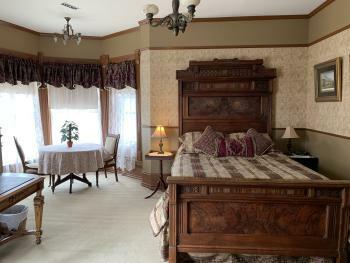 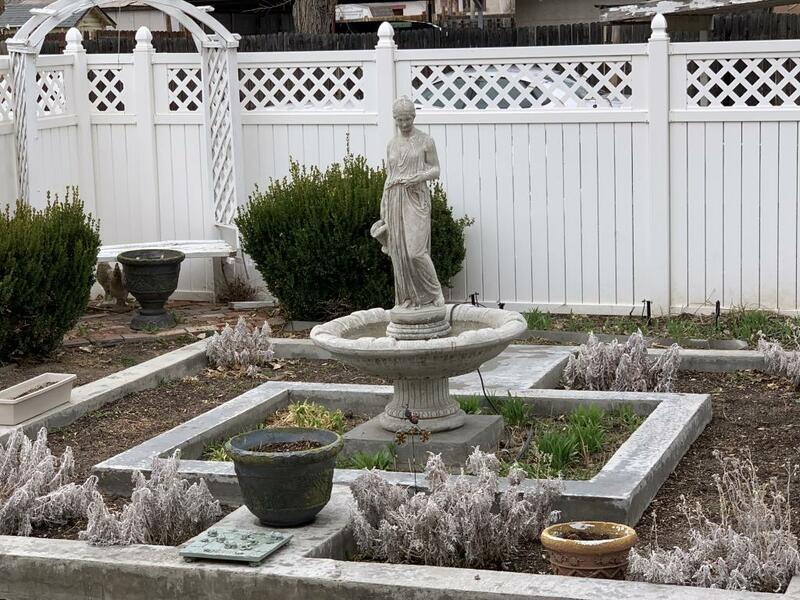 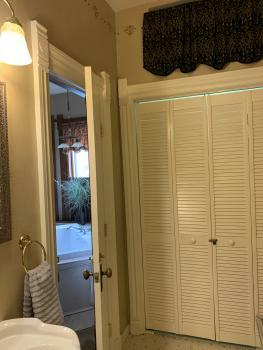 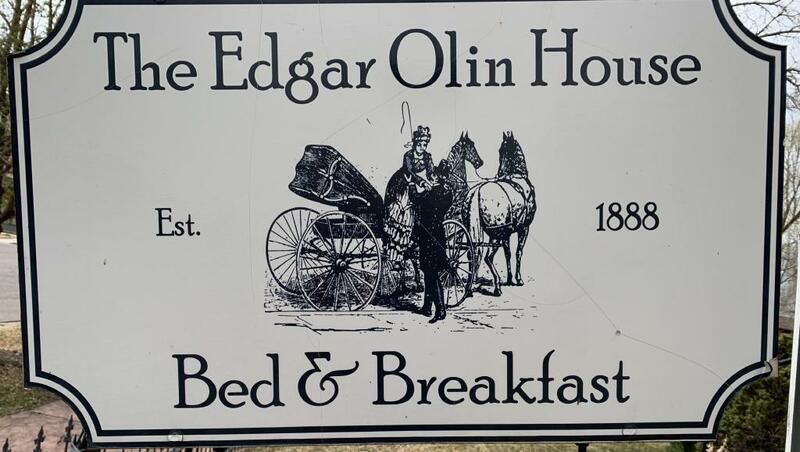 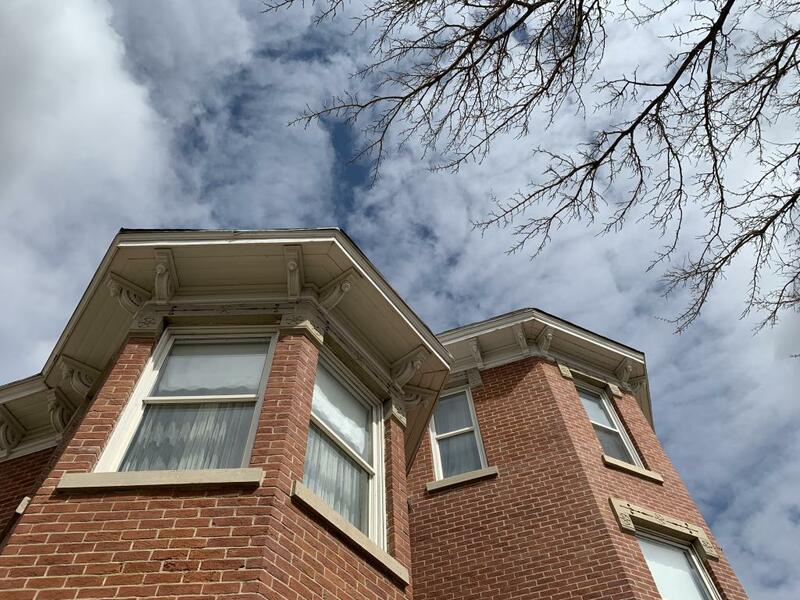 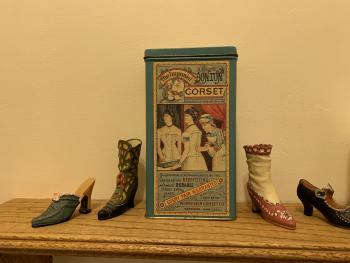 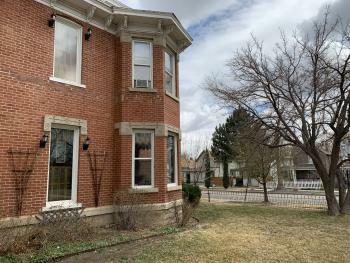 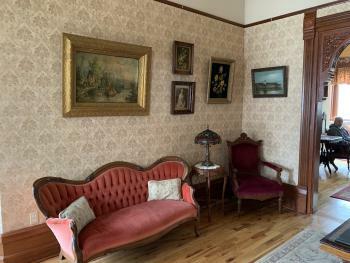 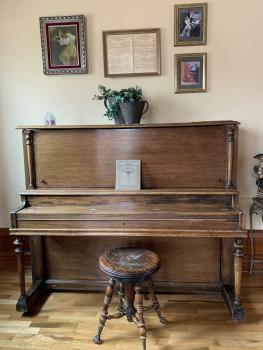 This unique victorian Bed and Breakfast offers full service pampering yet business friendly features like wireless intenet and free valet service. 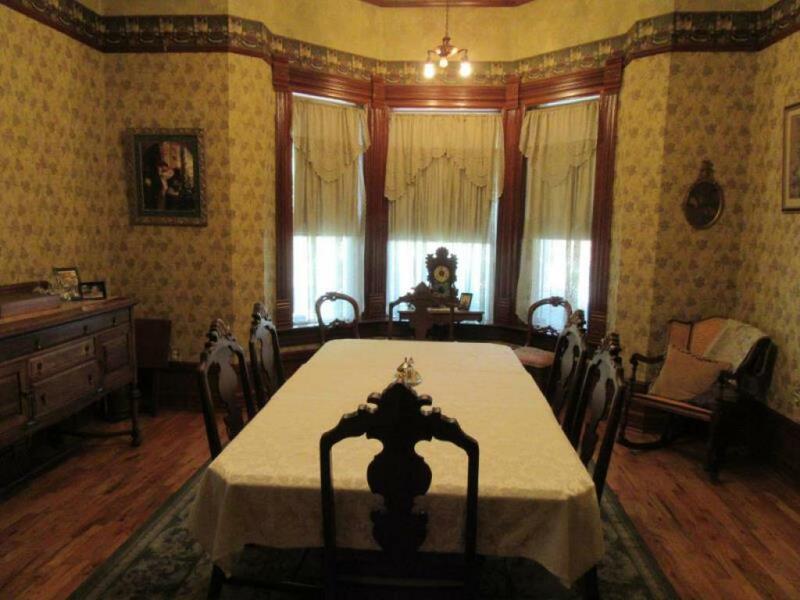 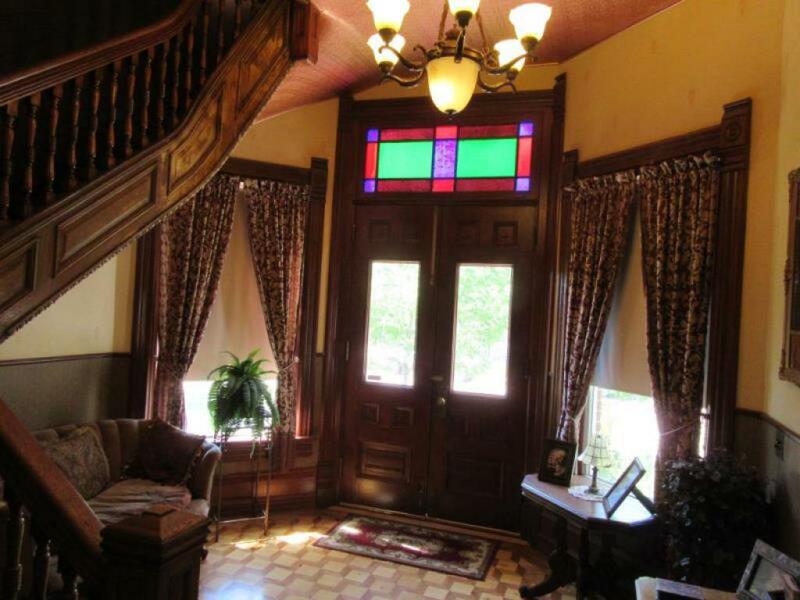 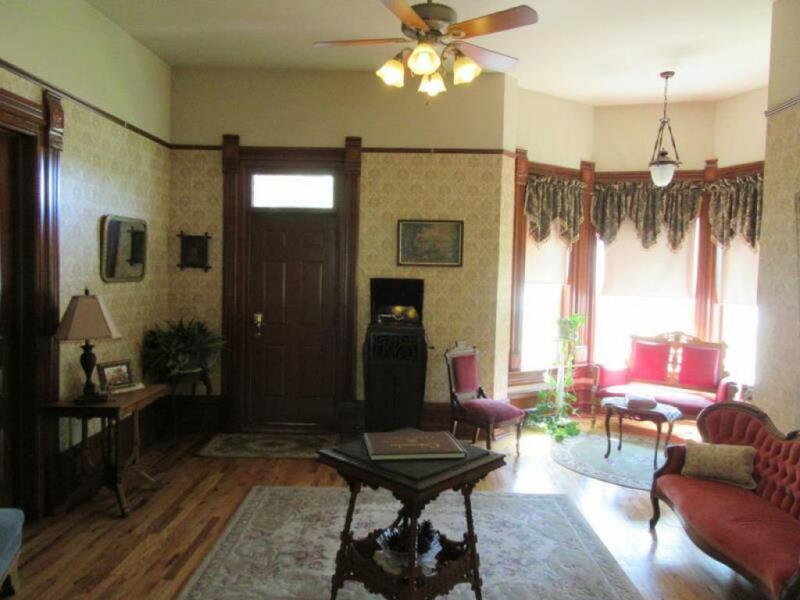 This home takes you on a voyage back one hundred years to an elegant time. 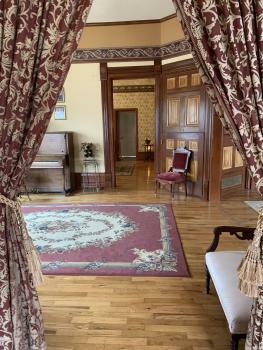 A vacation on its own with elegant parlors, library, gardens, and a park, all yours to enjoy. 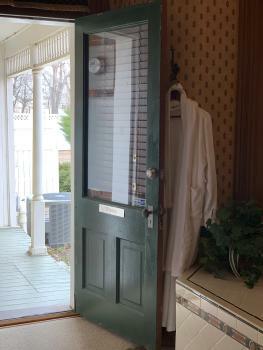 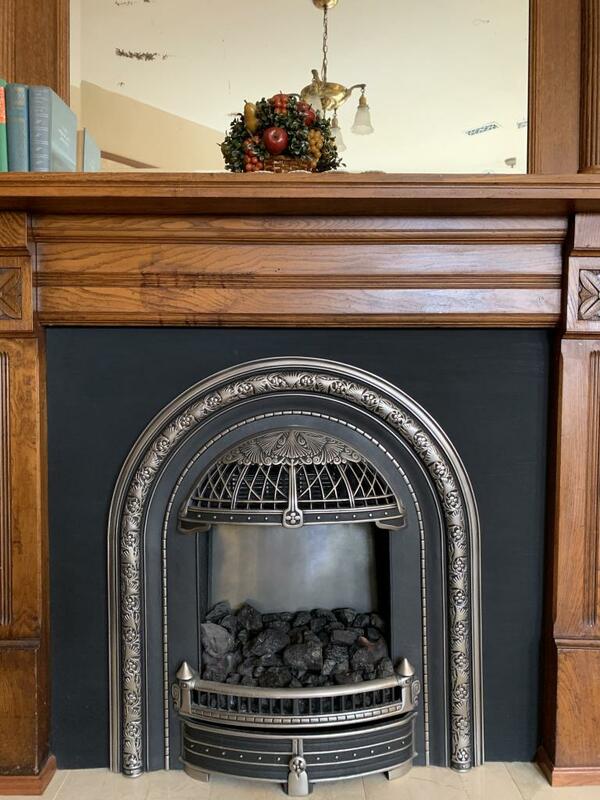 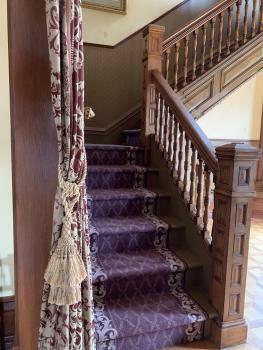 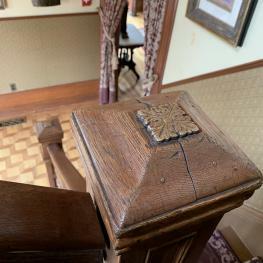 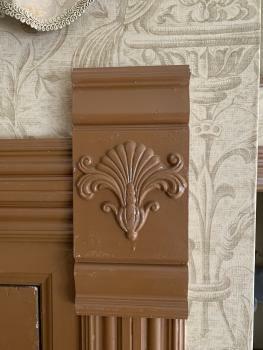 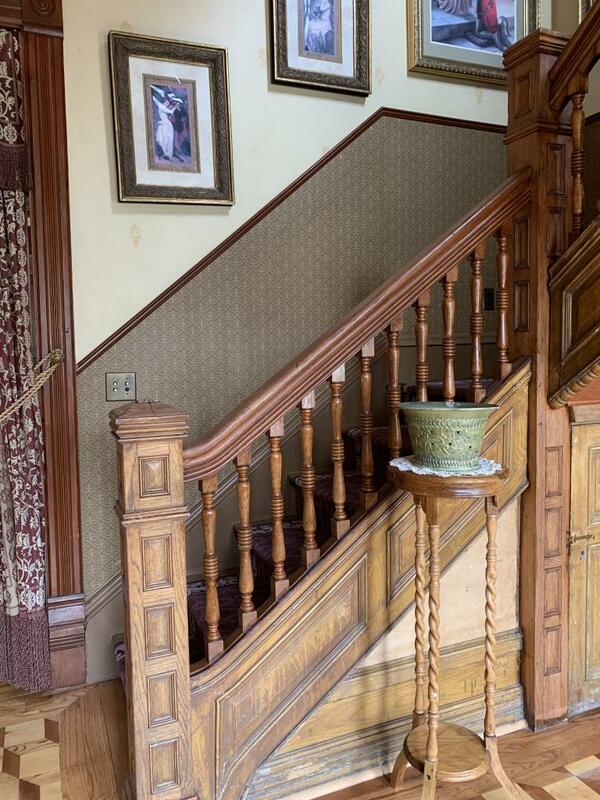 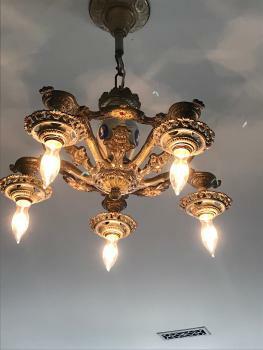 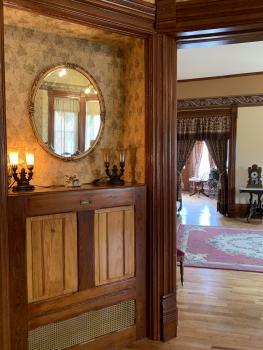 With dedicated research and craftsmanship, this home has been restored to its original splendor. 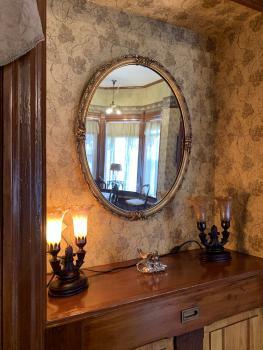 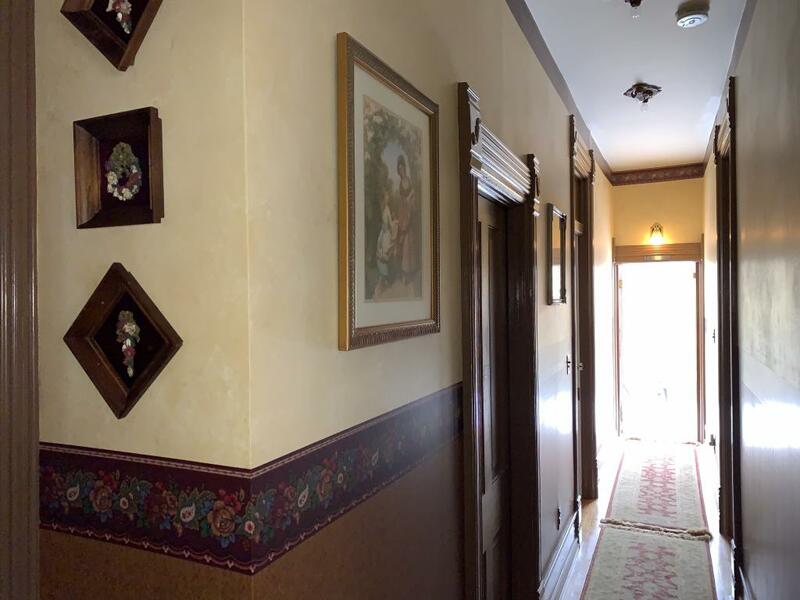 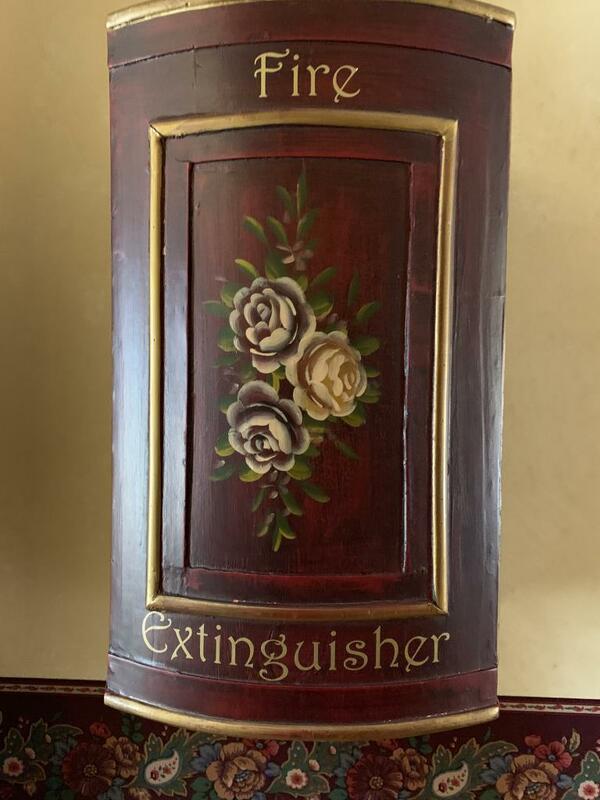 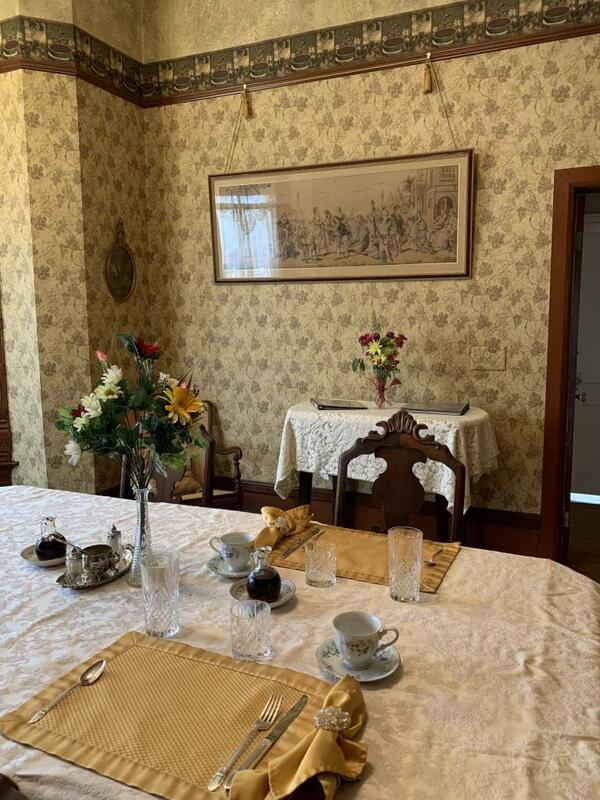 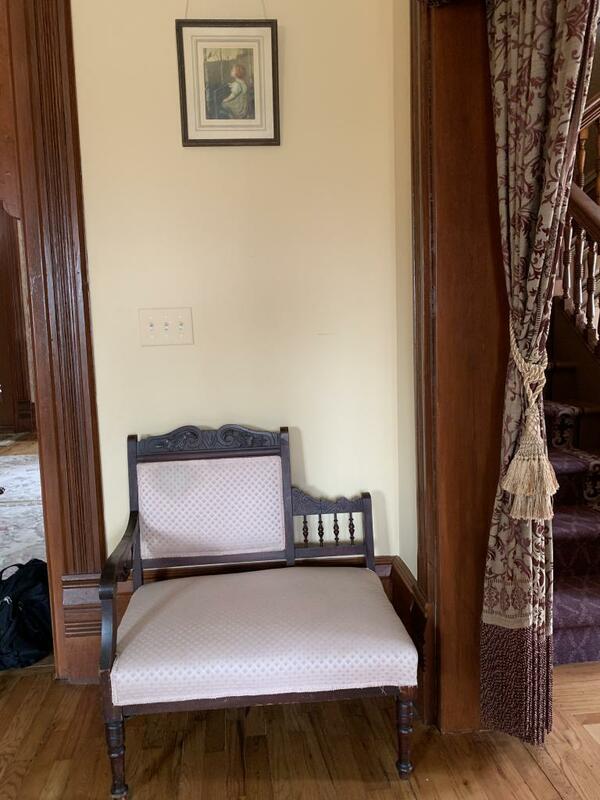 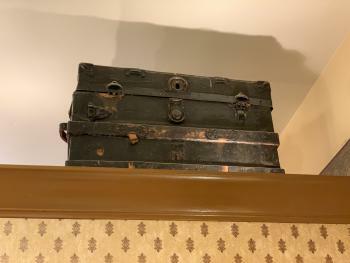 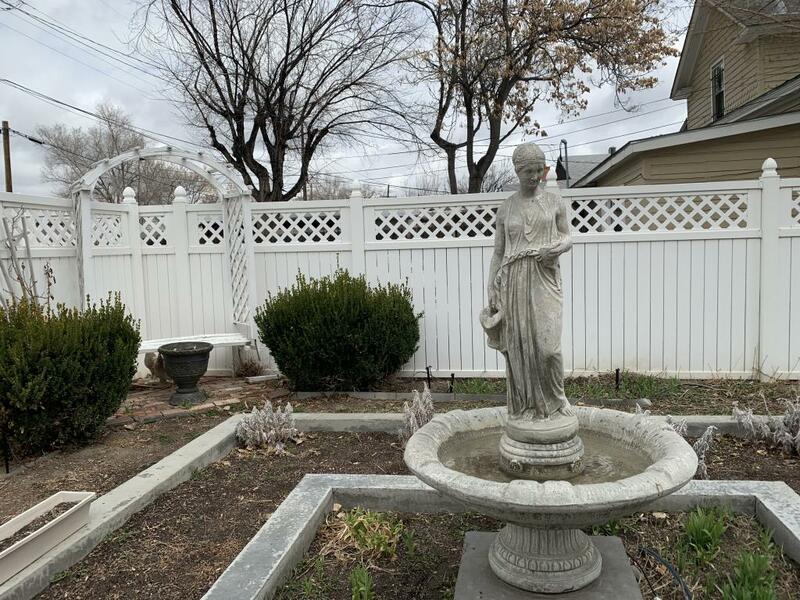 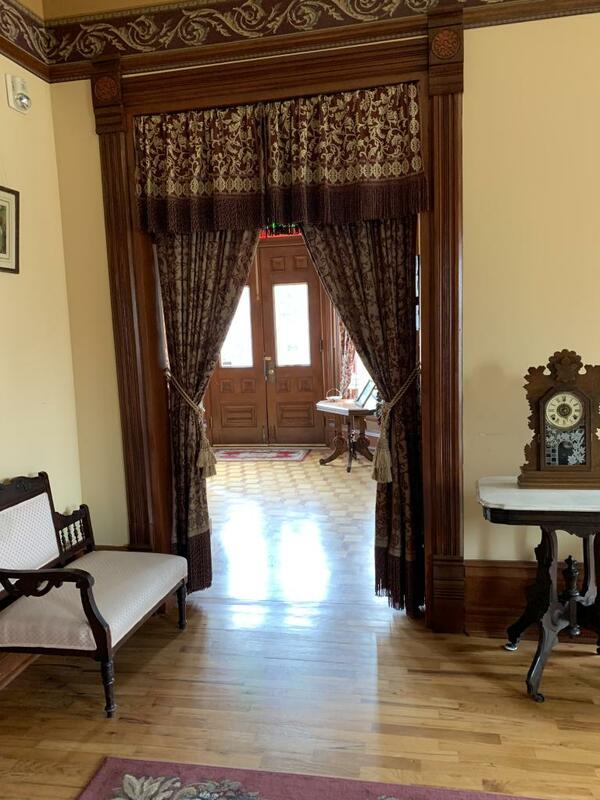 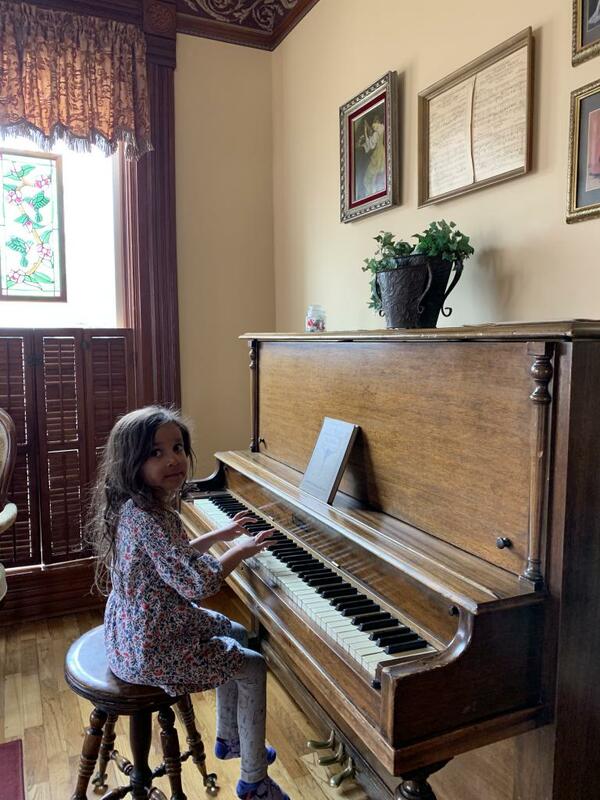 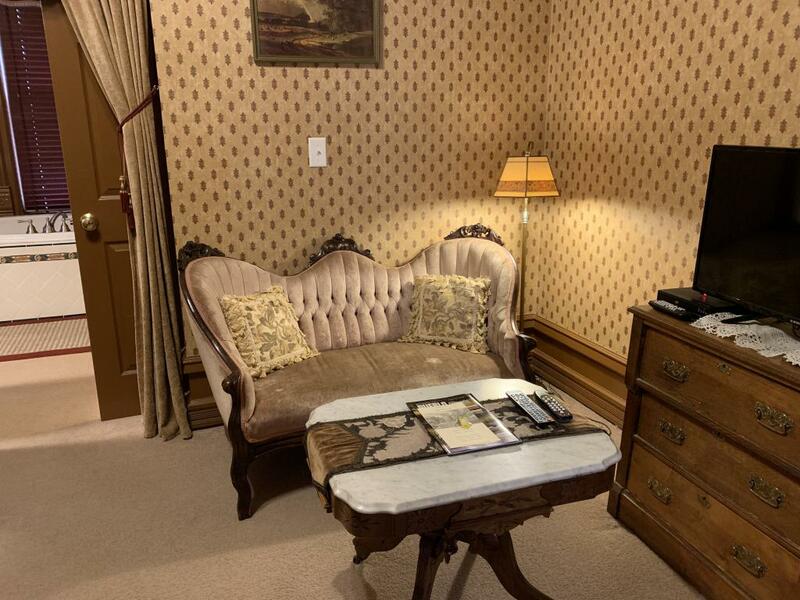 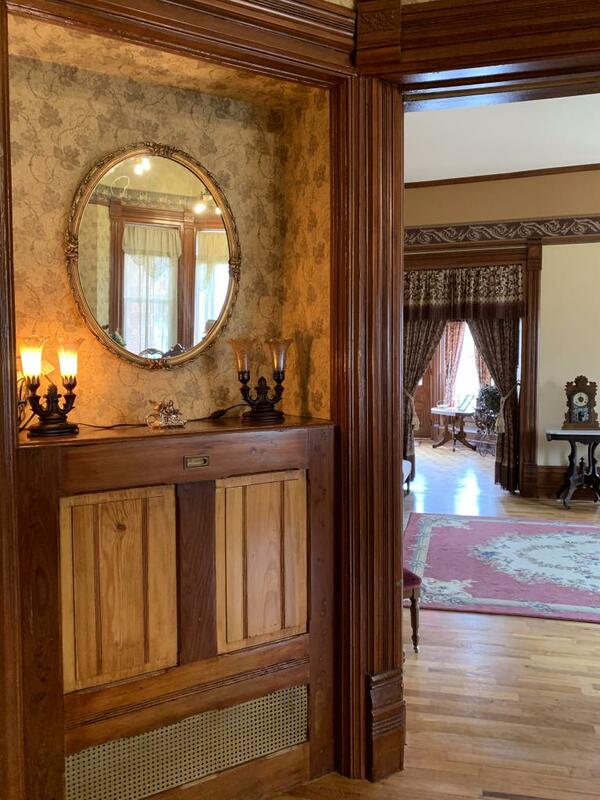 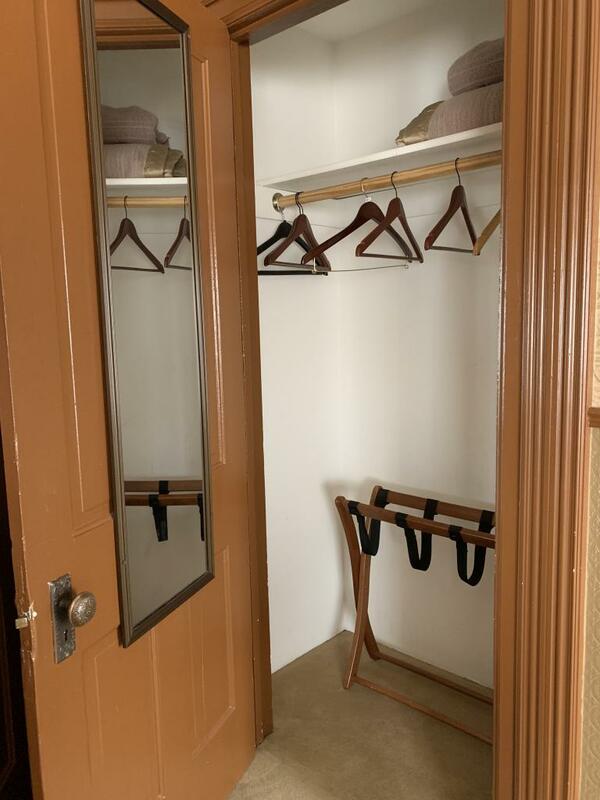 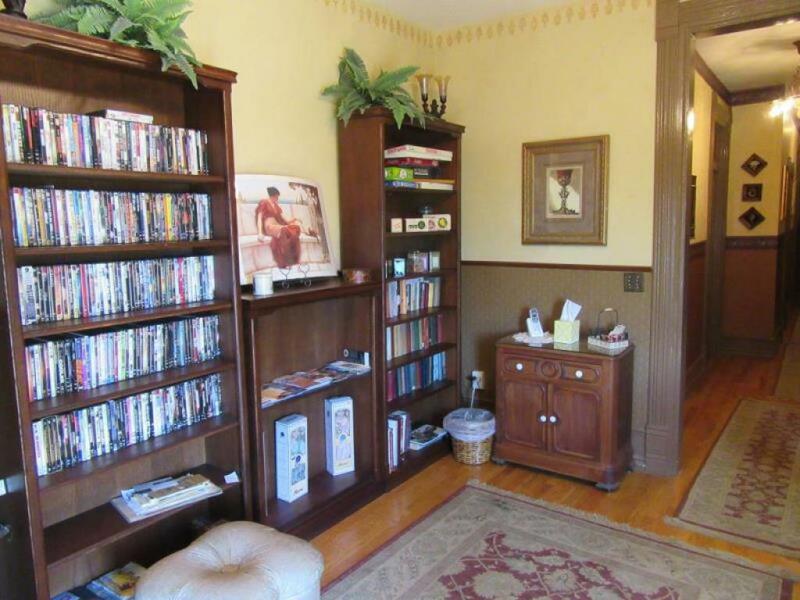 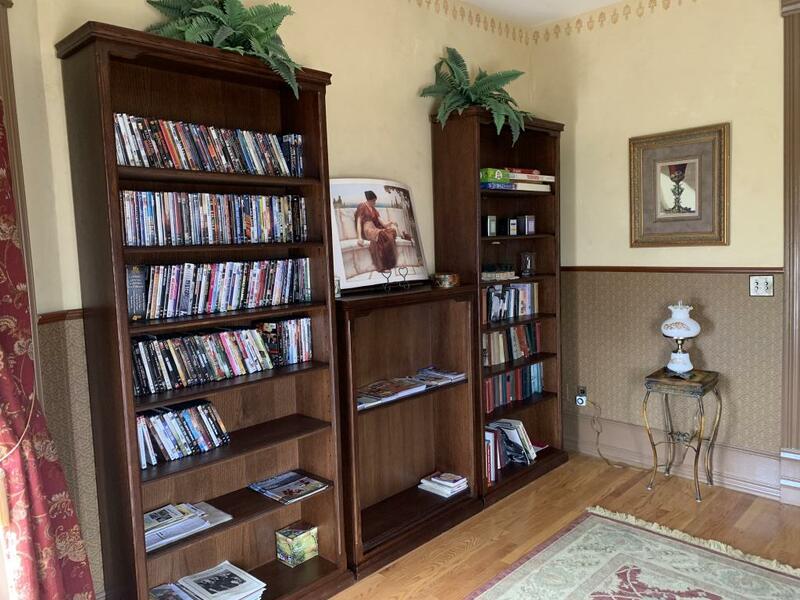 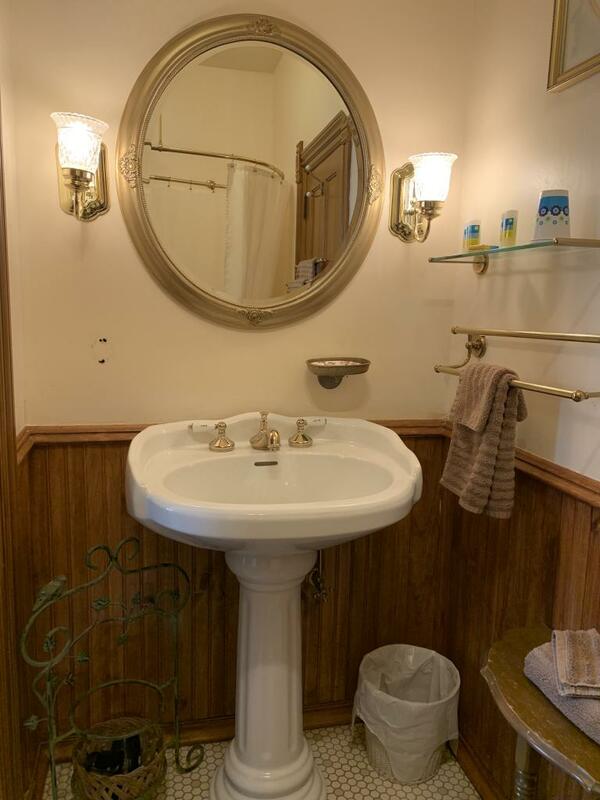 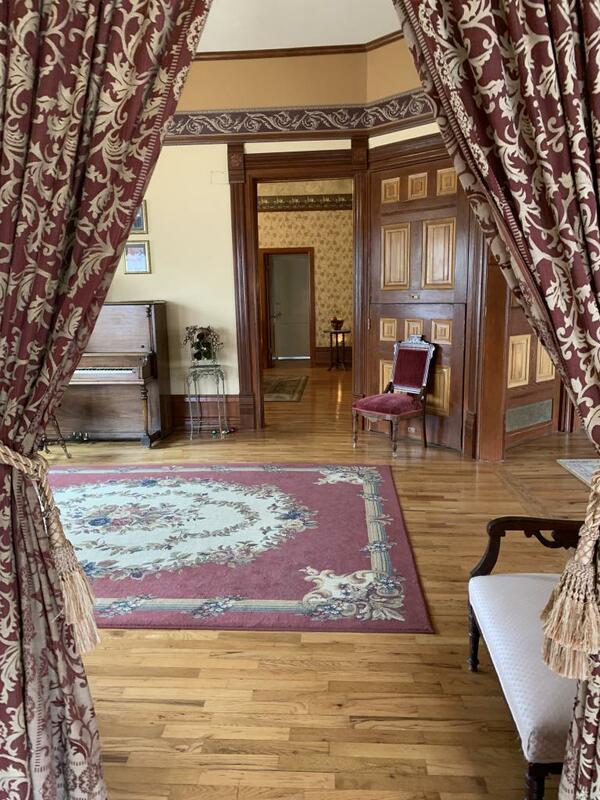 This attention to detail follows through with antique furnishings from the Victorian era, yet is equipped with all the modern conveniences such as free long distance phone service, high speed internet, printer, and cable television in every room.